A lovely easy to make dressing for your salad. In the summer I love making hearty salad entrees. There are so many things you can do with them and salad dressing is so easy to make! We made this one as part of our True Blood premier celebrations…I’m sure you can see why. So tasty and yet not so naughty! Remove the pits from the cherries. Put half of the cherries into a blender along with the vinegar, oil and water. Put the rest of the cherries into the blender and give a quick burst with the blender so that the cherries are just mostly chopped up. You can skip this step if you prefer a purely smooth dressing and just blend all the cherries in the first step. Serve! This made enough for two people to generously cover their salads. Each generous serving contains 39 calories, 1.2 grams of fat and .7 grams of fiber. It is wonderfully full of flavour using only natural sugars. To recreate the salad in the picture we also used: butter lettuce, 1/2 cup of cherry pieces, and 4 ounces of grilled chicken that we had lightly hickory smoked and sliced. Num! Great for those warm summer days. 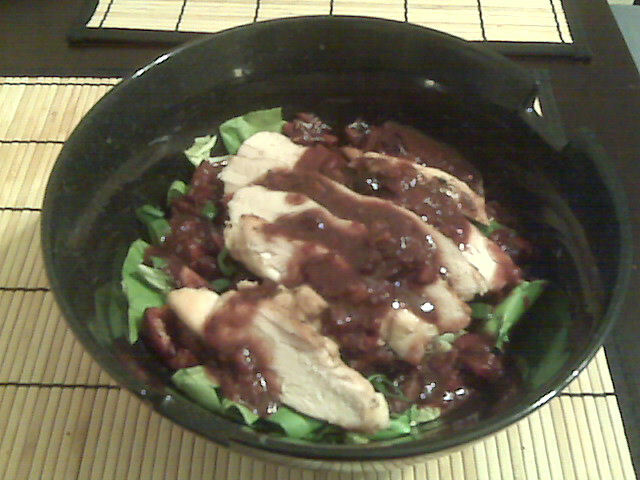 This entry was posted in Dinner, Ingredient, Lunch and tagged Cherry, Salad. Bookmark the permalink.